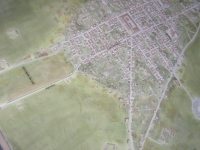 The status of Lutetia Parisiorum in antiquity is just a shadow of the present position of Paris. 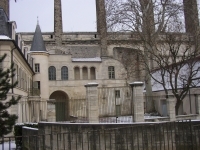 Lutetia had three bath houses. 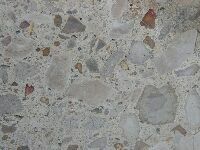 The oldest of which dated from the first century AD. 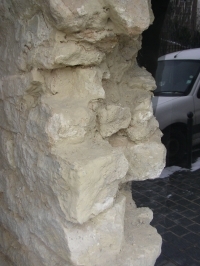 The basic water requirements of the inhabitants were at first satisfied by collecting rainwater, using the water of the rivers like the Seine, local springs and the use of many wells. 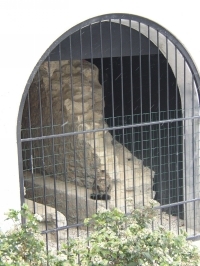 The bath house(s) required a better water supply so in the first century AD a 26 km long aqueduct was built bringing calcareous water to the town. 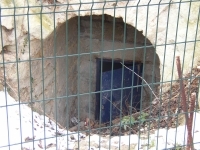 In 1903 Eugène Belgrand discovered the collecting basin of the aqueduct at Wissous, close to the present airport Orly, 16 km in straight line from the forum of Lutetia. 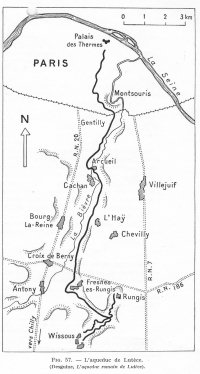 During the first phase it only served as a settling basin for the main line from the Wissous source, during the second phase the input was augmented by two other streams, one from Rungis and a second, smaller one also from Wissous. 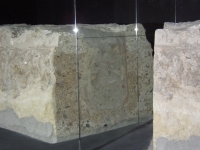 The basin measured 4,7 x 4,7 m externally and 3,2 x 3,2 m internally with a sunken floor of 42 cm. 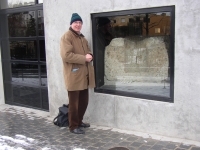 After excavation by Louis Tesson the basin was covered again. 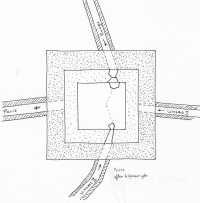 The conduit - some 0,40 - 0,50 m wide and 0,50 - 0,72 high with a flat roof, built in the cut and cover way - entered the La Bièvre valley at Fresnes, turning to the North to L'Haij-les-Hoses and in Arcueil-Cachan crossed from the East to the West bank by an aqueduct bridge. Only a few traces of the bridge over the La Bièvre remain. 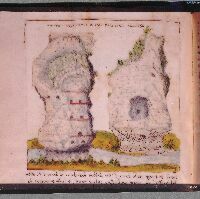 In 1585/1586 a Dutch student Arnold van Buchel / Arnoldus Buchelius gave a description and sketches of what in his time was left of the bridge. 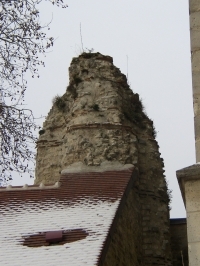 The pillars were made of small-masonry rubble stone alternating with bricks; they were 1,90 m broad at the bottom and 1,65 m at the top. The bridge was about 330 m long and 14 - 16 m high. 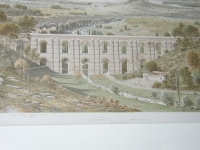 The more 'recent' Medicis aqueduct (1620) with the Arcueil/Bertrand aqueduct (1860) on its top runs almost parallel. 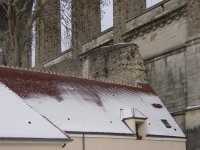 The name Arcueil seems to be derived from the Arches of the aqueduct bridge(s). 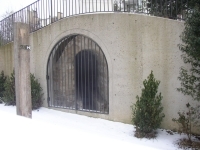 The aqueduct continued in northerly direction towards Gentelly and ran along the Montsouris hill. 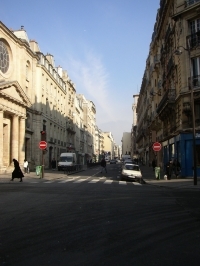 During the 1990's an area between the Rue d'Alésia and the Avenue Reille - the Z.A.C. Alésia-Montsouris - was developed. 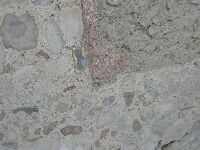 A 300 meter long part of the aqueduct was found and a fierce discussion on preservation started. 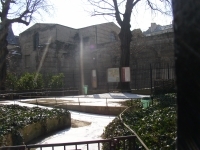 The result of this debate was that only a few traces were preserved and were integrated in a children playground and in the basement of some new flat buildings in the Rue Thomas Francine and the Rue de l'Empereur Valentien, close to the Avenue de la Sibelle. 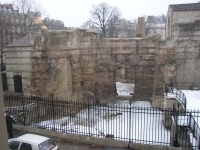 After a major bend the aqueduct turned in northerly direction again, along the cardo maximus of Lutetia, the present Rue Saint-Jacques. 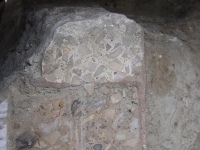 Remains of this part of the aquduct have been identified by chance in many districts of Paris during excavation projects. 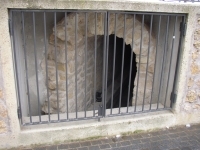 However it is unknown how the aqueduct supplied one or several of the bath houses near the ancient forum close to the South bank of the river Seine. 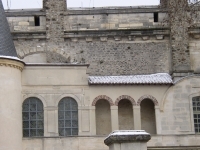 It is taken for granted that the principal one, the Themes de Cluny, was fed by the Lutetia aqueduct, the capacity of which was about 2.000 m3/day. 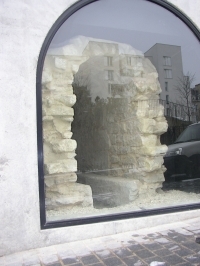 In 1989 another part of an aqueduct of different type of construction, has been discovered under the hospital 'Intitute Curie' in the Rue Louis Thuillier. 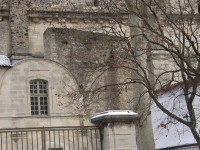 It might have been a deviation of the main aqueduct and / or might have conveyed water to the Collège de France bath.